After running a few errands last night (picked the girls up from school, picked up son from school and taking him to work, ran to Trader Joe’s in downtown Ft Worth so the girls could replenish their need for some sort of “cookie spread” stuff, a quick meal at Chik-Fil-A, and a few items at Sams), we were on the drive home. 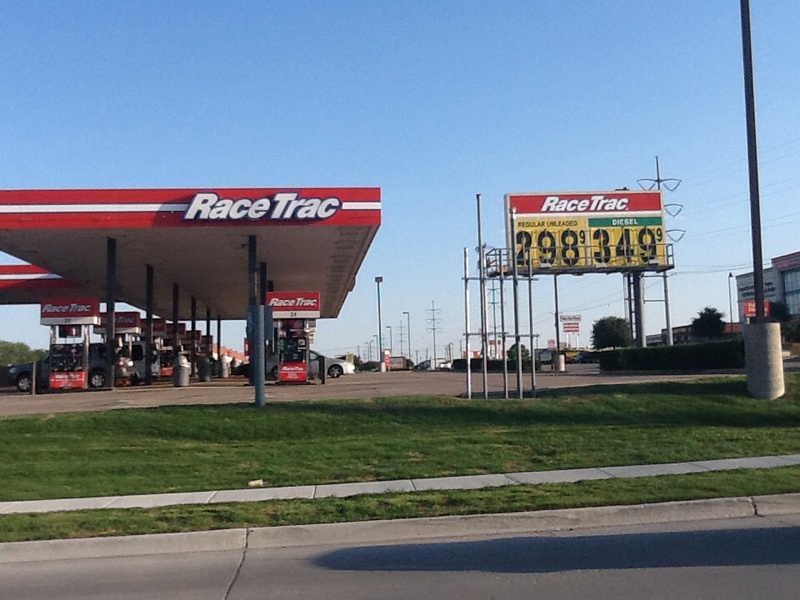 When to my amazement, I looked up and saw the RacTrac lowering their price on gas. I was already kicking myself for not getting gas at Sams for $3.219. When I saw this (see above) price change, the ability to cut across 2 lanes of traffic to make it to the turn lane seemed like a privilege. After pulling in at the pump, I needed to verify the pump matched the sign. And, it did. I took a look around the lot and everyone appeared to be dressed in the appropriate dress for our temperature and era. (It just seemed so very ironic that I was able to watch them change the gas price. It is like a small tear was opened up just for me to creep into it. ) Maybe other peoples lives are more exciting then mine. As I was filling the car, I expected others to be going, “Can you believe they just lowered the gas price? I wonder what the special occasion is? Is there a price war going on? Maybe I should look to see if one of the other stations is cheaper?” Without any of this dialogue to distract me as I waiting for the gas to finish pumping, the “tear” theory seemed to become much more of a possibility. I completed the transaction…making sure the gas price did not spike somehow in mid-fill-up. As we left, I again looked at the other patrons. They all looked fine. However, it kind of seemed like their lips were moving extra slow and their movements were somewhat choppy. My daughter snapped the picture as we left just to make sure I had not imaging the whole thing. Fortunately, the needle on the dash went up to full, so wherever it was I got the gas, it was substantial enough to actually take up space in my tank. Also, I was very careful to leave the “tear” the same way I entered. My obvious concern was if I entered the continuum in the wrong place I might run into myself back at the house. Finally, the new day was born and ran my girls to school again. The gas station who sold me the cheap gas was now back to the price my gas was lowered from. Neighboring gas stations had raised their prices almost 25 cents. If someone is about to pull out in front of you and you have the right away but may give them a look like “Really?”, is that worthy of a flip-off? If the infraction takes place behind a tinted window is it done just to relieve the tension of the driver OR are flip-offs always meant to be seen by the one who incited the flipper? The driver was male. Do males flip-off more often then women? My guess is “yes”, but it seems both genders get pretty sensitive when their driving skills are questioned. Is there something worse then a flip-off to release driving frustration? Was the driver REALLY mad at me or was it just the reaction I might give if I touched something hot. My hand pulls away from heat while his brain tells his hand to do the “gesture” when his pride is slightly to moderately bruised. When I make driving errors, I typically am angry with myself. Is our society setup now so that when someone catches you doing something you know is wrong the anger needs to be purged from your system by doing the gesture? I was taught that you are responsible for your own actions. I was taught to be a responsible driver–realizing some of my decisions can effect others. It is a responsibility not for the faint-hearted. Is it possible the way we drive has been influenced by the selfish decisions many of us make in other parts of our lives? Do many more of us need therapy than realize it? Is the “tool” we call a car only an outward agent to act out our deep feelings of loss and disappointment? Never really aspired to be a nudist, but these handy rules would certainly prepare me for dining. A simple reading of the “rules” will hopefully convince you that even if your body was a few years younger, you do not need to rethink the “nudist” option.